n the UK, the biggest defeat in Commons history has become a victory for the embattled prime minister with GBP higher even as the path to Brexit becomes harder. The hope is that there is a delay and/or a referendum. The odds for such are prices at nearly 40%. This leads to UK May more likely to remain in office until June, with those odds over 50%. In China, the lack of progress on structural issues hangs over hopes for a bigger trade deal with the US. The upcoming new year celebrations distort the economy there and squeeze money. 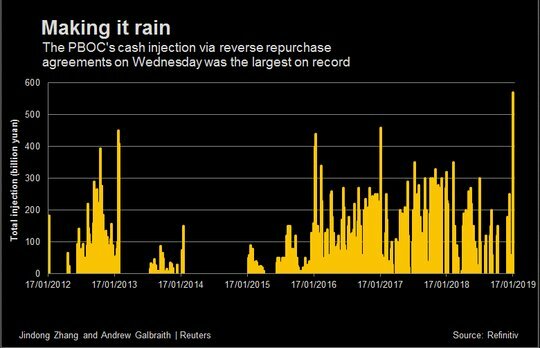 China PBOC adds a record $83bn via reverse repos today – trying to offset the new year squeeze and add to liquidity even after the RRR cuts have put another $116bn estimated into the system, and still this isn’t enough. Further, China is seeing the easing of credit lead to the flows into less productive price gains – witness the house price jump in the big cities with overall up 9.7% y/y. For the rest of the world, weaker Japan machinery orders, lower PPI, lower CPI in Europe and in the UK – all suggest that the disinflationary impulses from US/China trade, lower oil prices, lower global trade orders – all are in the works for 1Q and leave central bankers looking a bit overdone on their quest for normalization. ECB Draghi made that clear yesterday, Carney seems likely to say the same today and many of the Fed – including the hawkish Kansas City Fed President George yesterday pushed for a pause. We are in a world that is waiting for good news but can bear bad news until it overwhelms. Watch the USD/CNY as that barometer as the capital inflows that helped support it are clearly slowing and 6.71-6.73 holds.